Ramon Tapia looks to the launch of his brand new label Say What? with a single of pulsing, tech infused house featuring a remix from Secret Cinema. 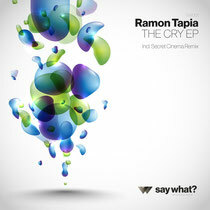 Over the past decade Belgian based DJ/producer Ramon Tapia has made quite a name for himself. His releases for labels such as Great Stuff, Turbo and Strictly Rhythm have established him as a key producer in electronic music whilst as a DJ he has travelled the globe delivering his own style of house and techno. Now Ramon is looking to the launch of his own Say What? Label, an imprint that is to serve as home to his own productions. To kick-start the label, Tapia offers up his new single, ‘The Cry’, a deep and percussive, pulsing house cut that fuses melody with dancefloor sensibilites. The original version has a hypnotic and almost haunting quality to it, offsetting the melodic elements with an understated rhythm track and production twists. Accompanying this Tapia offers up his ‘Deep mix’ which sees tribal drums and rolling bass leading the charge in this stripped back mix. To complete the package, Dutch production veteran Jeroen Verheij AKA Secret Cinema supplies a remix that journeys into deep, rolling techno. Mesmerizing loops and searing drums provide the sound-bed for an intense driving arrangement that features once again that distinctive glockenspiel sample. Out 11th June.